One or more methods can be applied depending upon the site and requirements. For example, a Resistivity imaging survey combined with Seismic Refraction can help resolve uncertainties if the bedrock interface is highly weathered. 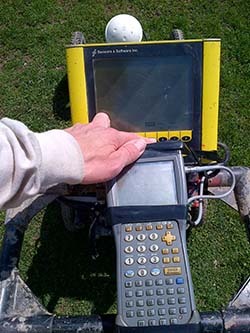 GPR can be used to detect karst terrain if the overburden is not too clayey. TDEM soundings are used in areas where local infrastructure make it unfeasible to lay out long seismic or resistivity cables. Frequency domain Electromagnetic instruments such as the Geonics EM31 can map variations in the overburden to complement another method such as GPR.